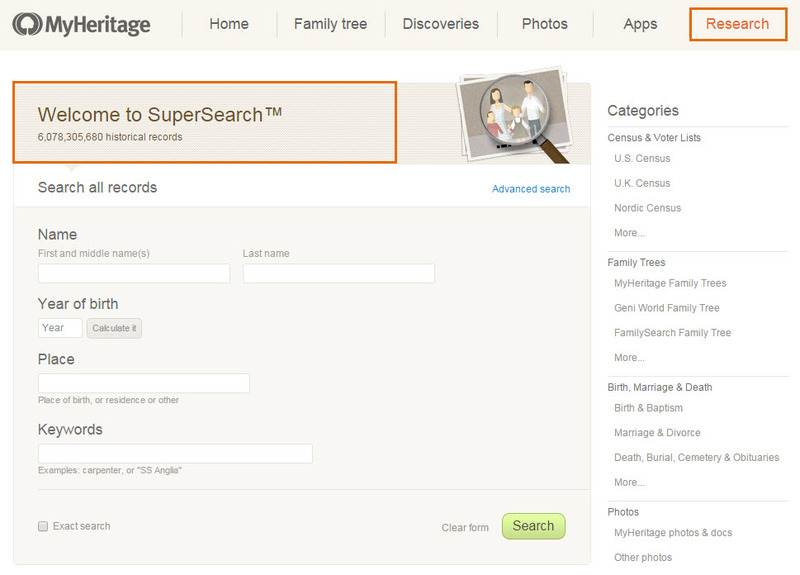 SuperSearch is MyHeritage’s search engine for historical records. Click here to visit the SuperSearch page, or click on ‘Research’ tab on your family site. SuperSearch includes more than 9 billion genealogy records such as birth, marriage, death, burial, census, military, immigration, yearbooks and other types of records, plus scans of the original documents. It also includes MyHeritage family trees, photos and members that are public – altogether more than one billion exclusive records from all over the world that in most cases can only be found on MyHeritage. SuperSearch provides worldwide coverage with content relevant to all countries. We are rapidly expanding the data sets and plan to grow SuperSearch over time to become the largest international collection of historical documents available online. Around 200 million additional records added on average every month! If you would like to learn details about how SuperSearch works, please read the following FAQ: How do I use SuperSearch?